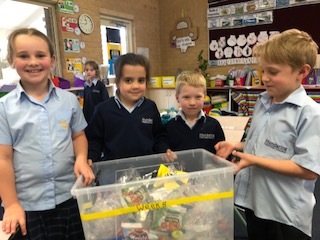 On Monday we collected all the plastic that students used for their lunches and recess. We placed it in a container. Mrs Wilson showed it to us at assembly. A yellow line shows how much plastic was collected. We are going to measure the plastic from our lunch boxes every Monday. Let’s help save our planet! Here at Mundaring Christian College we have started a movement called Waste Free Mondays. 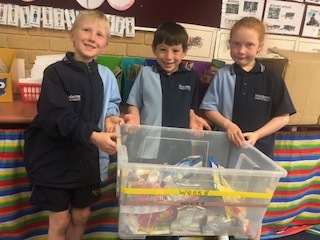 Waste free Mondays is when one day of the week we put our plastic rubbish from our lunch boxes e.g. chip packets, and cling fill into a plastic tub in the undercover area to see if we are collecting less each week. So if you don’t want animals to die and the country to look covered in rubbish, put a stop to single use plastics. Some of the students at MCC think it is a good idea and some think it is bad. Mrs Wilson said that it is a good idea because the environment is very important to her and she loves animals so it would be heart-breaking if one got killed and it was her fault. So put a stop to this single use plastic at school and bring your own containers. Also, remember not to leave your bags unzipped, or a furry friend might come home with you (this really happened to a pre-kindy student)!